I’m happy to report the NRC is about to unveil the most significant update to our Website in 10 years. NRC.gov will switch to its new design and functionality on midnight this Friday. We’ll troubleshoot over the weekend and make the formal announcement of the new and improved site on Monday. You can get a sneak peak now, though, with this video or this video. The redesigned site has better navigation, content and accessibility. Our goal is to make it easier and quicker for users to find the information they want. We consider this redesign an important part of our ongoing support for the goal of openness, transparency and public outreach. • Consistent navigation in the header and footer areas aids users in moving through the site. 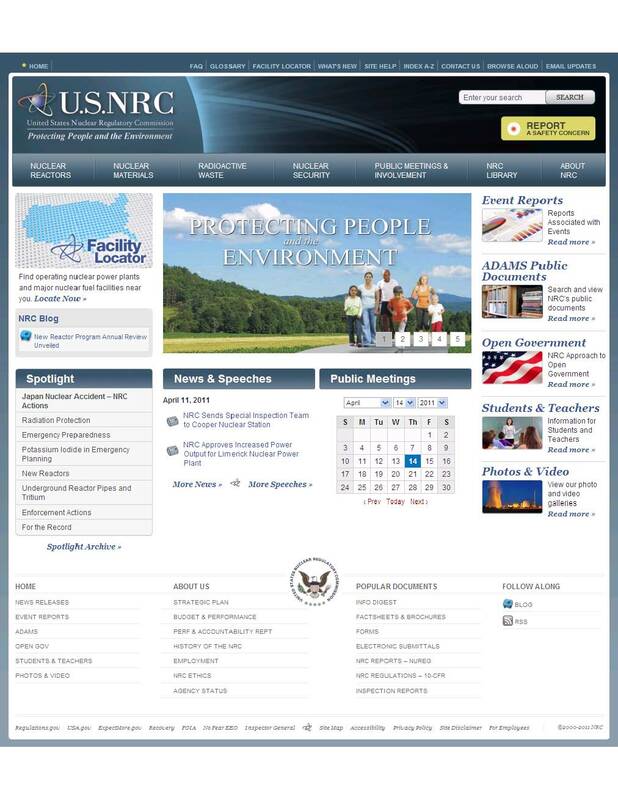 Please visit the improved NRC.gov and then let us know with your comments here what you think. The NRC Agreement State directory maintained by the Oak Ridge National Lab has been restored and can be accessed at: http://nrc-stp.ornl.gov/rulemaking.html . We apologize for the inconvenience. Thank you. This verbiage has been changed. The links listed above, which have nrc-stp.ornl.gov as part of the address, are directed to a non-NRC server that is currently down for reasons unrelated to our redesign. We hope it will be restored soon. In the meantime, for assistance, please contact your NRC state liaison individual. Agreement States information is here: http://www.nrc.gov/about-nrc/state-tribal/agreement-states.html . Many of the links on this page are hosted by a non-NRC server, which is temporarily down for reasons unrelated to our redesign. We hope it will be restored soon. For help in the interim, contact your NRC state liaison person. Jack — We’ll contact you directly. The link to the registry is currently down due to server problems unrelated to the redesign. Thanks for the feedback. We’ll look at the timing. Thank you for the heads up. We’ll get the links fixed. It would be nice if the old links took you to the new location, at least for a few weeks. I can’t find anything I use. Where is the information for Agreement States? How can find the information on training courses? All of my links to various NRC pages that I had saved in my favorites are not working. Where is the access to the SSDR for state rad. people? Please slow down the speed of the pictures on the main page. There is not enough time to figure out what each one references before it changes. Also, if you are trying to look at other things on the page, the moving pictures are distracting. Nice so far. I like the new layout. Your PWR description is still in error as before the wesite upgrade, perhaps you will fix it now. ” The resulting water is pumped out of the condenser with a series of pumps, reheated and pumped back to the reactor vessel. ” The water is pumped back to the steam generators not to the reactor vessel. This apparently has been cut and pasted from the BWR description incorrectly. I just saw the sneak peek, and I think it is a step in the right direction. I like the new site, I hope it will be easier to navigate as much as this one. We have not moved any content around, so links/bookmarks should continue to work. Will you have redirects in place? I have multiple links to subpages on your site. Thanks.